Did you know there were different fire extinguishers? While most people are aware that commercial buildings are required by law to have fire extinguishers, they are often unaware that there are different types of fire extinguishers. 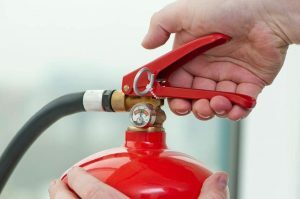 Business owners should always make sure that they are equipped with the proper fire extinguisher to combat the fires, most likely to occur within that type of business or facility. Here is a handy guide to help you know the various types of fire extinguishers and when to use them. This is probably your most common fire extinguisher. ABC dry chemical fire extinguishers can be used on a variety of fires. These fire extinguishers can be used on either a Class A, B or C fire. With a specially designed powder, ABC dry chemical fire extinguishers help to extinguish fires that are started by any burning gas or liquids, combustible fires or electrical fires. This is precisely why office building owners are attracted and often require ABC dry chemical fire extinguishers. These types of fire extinguishers are usually best in hospitals and other facilities that use any kind of sensitive equipment. The reason being, ABC extinguishers could harm or corrode the sensitive equipment in these buildings. However, the water mist fire extinguishers can safely put out a fire without damaging any vital equipment. With the assistance of a cold discharge, Carbon Dioxide fire extinguishers can remove the heat and oxygen from a fire. These types of fire extinguishers can’t be used on fires that are started by metals, they can be essential for laboratories. Class K fire extinguishers are actually wet chemical extinguishers that are typically used in kitchens. They work by creating a foam blanket that prevents a fire from getting re-ignited. However, it is necessary to note that these fire extinguishers should never be used to extinguish a gas fire. They typically reach a maximum range of eight to twelve feet at a rate of thirty to eighty-five seconds. This entry was posted on Thursday, December 14th, 2017 at 3:59 pm. Both comments and pings are currently closed.